I wrote this manifesto as a result of the comments I received from these inspiring educators — Rose Bard, Kristina Eisenhower, Anna Delconte, and Hana Ticha — on my post, Questioning Teaching: An Attempt to Balance Paradox. The manifesto is also a response to a previous 30 Goals Challenge created by Shelly Sanchez Terrell. I want it to be a motivating reminder of what is possible, especially during those days when teaching isn’t so easy. 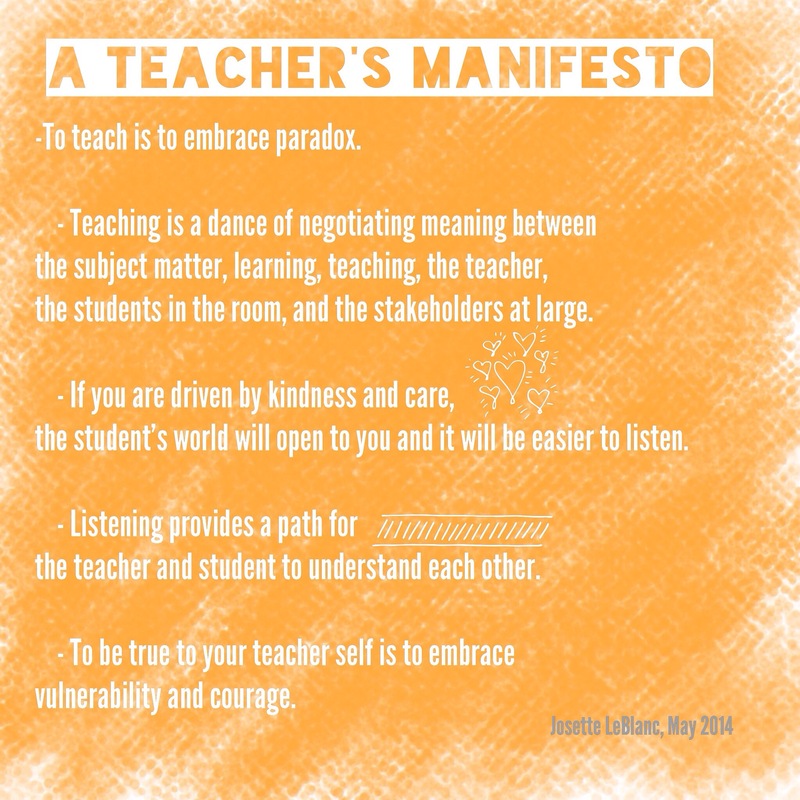 What would your teacher manifesto look like? For inspiration, check out these creative manifestos designed by teachers from around the world. Created with the Over app. Josette it’s amazing! I really loved it and inspiring as well. Well done as always dearest!! I’d love to read your manifesto Scott! Any chance that you could share a bit here, or share the link to it if it’s on your blog? You are just one inspiration after another! Thank you for providing the concept and label of the very issue I (too) have been struggling and striving to understand about myself — a teacher’s manifesto! Watch as I “throw a token of this back to you”! So deep and inspiring! I have the strongest feelings to the third and fourth statements. I appreciate you telling me which parts of the manifesto connected to you. I think this is the beauty of reading manifestos from other teachers. It can help you see what might be more important to you at the moment. Those statements were important to me because they helped me see that sometimes it’s not about what I can do as a teacher, but what we can do as partners in learning. It’s so right. I think this ‘partners’ attitude is essential in teacher-students relationships but not many teachers think about it staying just at the level of good planning and performing due to lack of experience or interest or something else. Thanks for making me think about it. A great reflection Josette. I am taking a screen shot of this and putting it in my office!